They have lost four of their last five games and have dropped to 12th in the League One table. "That was disgusting. I'm absolutely embarrassed. It's not acceptable," Robinson told BBC Three Counties Radio. "[No] hunger, fight, determination. A lack of understanding. Stupid mistakes and getting punished. Shambolic. Absolutely rubbish." Robinson refused to talk to his players immediately after the game, and conceded the margin of defeat could have been as much as 6-1. "That's as embarrassed as I've ever been on a touchline. First half we did OK. But other than that there wasn't a positive," he said. "I've got a job on my hands. It's the lowest and most difficult it's been for me and I have to respond in the right way. "And I will. I won't shirk responsibility but I need the players to come along with me." 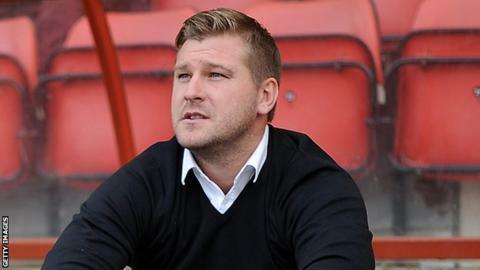 The 33-year-old, who was the Football League's youngest manager until Lee Johnson's appointment by Oldham in March, added: "It's me as well. I was poor. The players were poor. Colchester did very well. But we've been embarrassed. "It's not possible to bring anyone in [on loan]. I think I have to apologise to the chairman first."